That first gathering had 2,000 attendees. 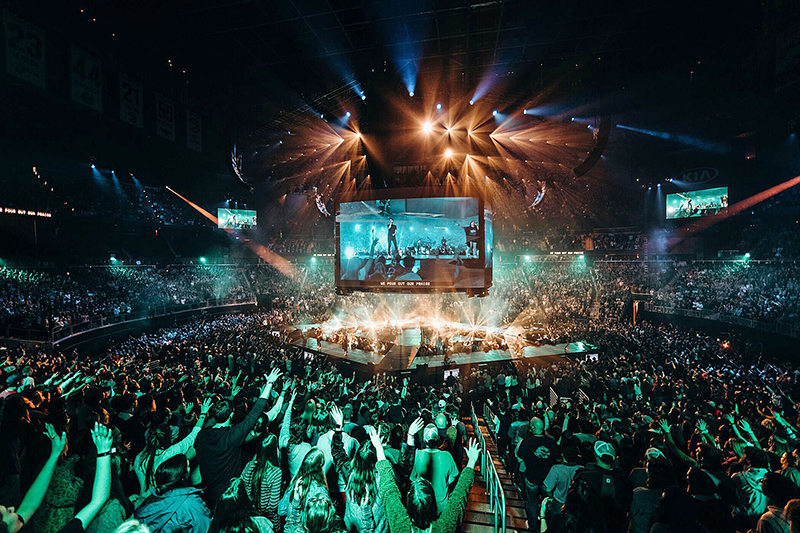 Now in its 21st year, Passion 2019 attracted over 40,000 young adults, aged 18-25, to the three-day conferences held at four different venues in three host cities in early January. Passion booked two arenas in Atlanta to serve the South — State Farm and Infinite Energy. Students from the Northeast met at The Anthem in Washington, D.C., while farther west, the Theatre at Grand Prairie outside of Dallas served as the fourth location. 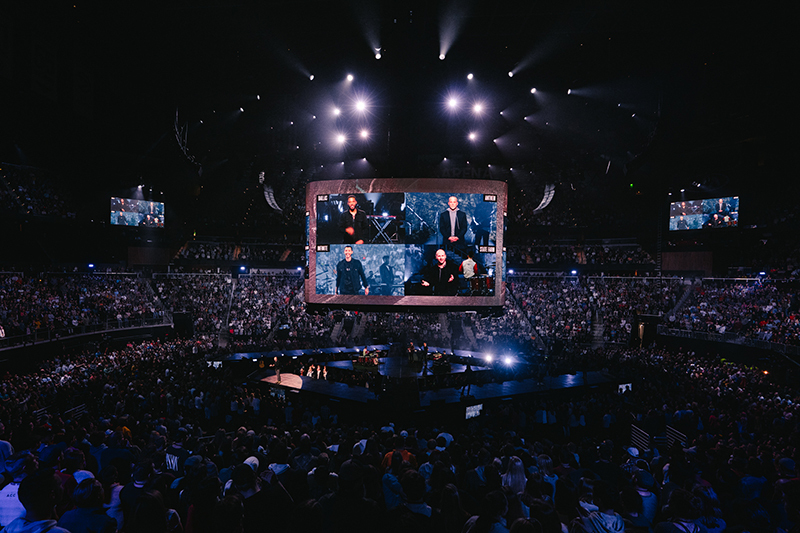 The core creative team at Passion Conferences includes Jonathan Sheehan, Chase Hall and Taylor Charboneau. Sheehan, as global brand curator and director of events, is responsible for all large conferences and events, overseeing everything from sales to programming. He has been with the Passion over 12 years. As Passion’s production manager, Taylor has been overseeing the production teams since 2016. 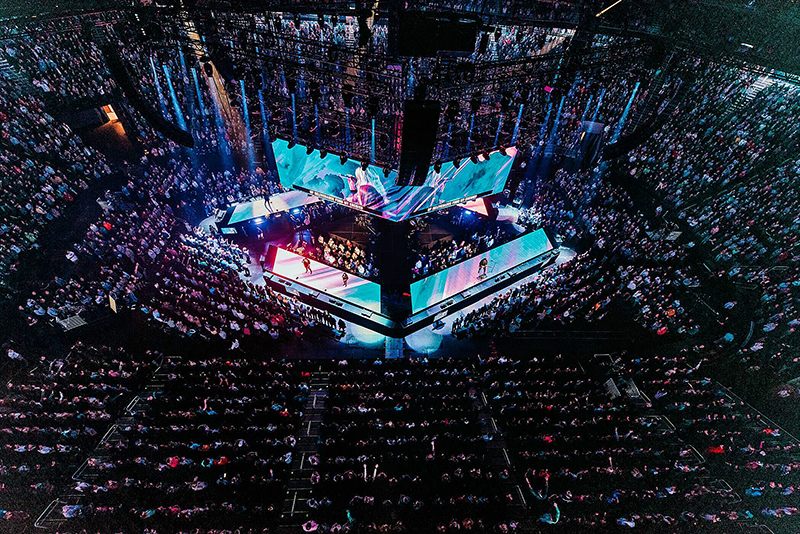 Chase Hall, production designer for Passion City Church, has also served as the lighting designer for the Passion Conferences for the last three years. 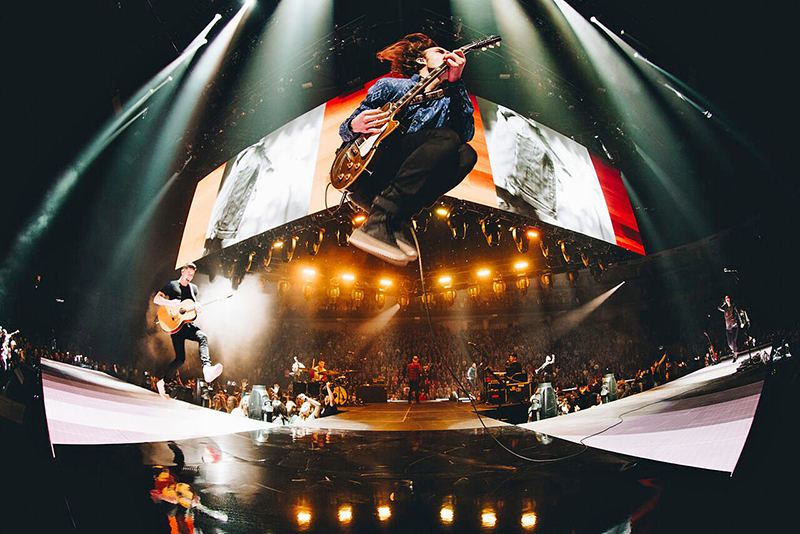 Due to the complexity of managing four different venues simultaneously, Sheehan hired production designer Nathan Paul Taylor and U.K.-based production management company Black and White Live, led by Ian Cattle, for an assist. His company has produced the Passion Conference since 2013 and, prior to that, Cattle has worked with Passion on their World Tours. One of the main visual framing objectives Passion sought was to keep the hanging LED walls simple in the 16-by-9 ratio, yet do so in a unique creative way. Passion went with an angular design nicknamed the “battleship,” due to the way that the truss and overhead LED screens were hung 45 degrees off axis to the room. Viewed from any side, the angles these displays give the of the prow of a ship, and lent themselves to that ratio. The perimeter stage decks were comprised of LED tiles that mirrored the angles in the air. “From that point, It was a matter of re-imaging Nathan’s original design to fit the nuances and particularities of each venue separately, while remaining true to the overall concept,” says Cattle. 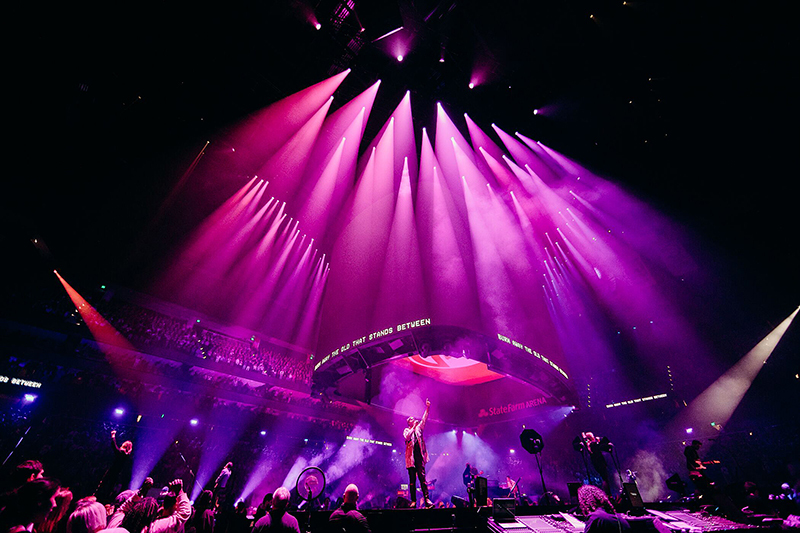 The Passion team turned to their preferred lighting vendor, Bandit Lites, to supply the rigs for the two Atlanta arenas. Local vendors Gemini LSV in Dallas and Afterglow Lighting in DC supported the theater productions. “Mike Golden, VP at Bandit Lites, is fantastic as a project manager, and his guys Jimmy Hatten and Gene Brian are very detail oriented, which just adds to our confidence of meeting Passion’s needs,” adds Ian Cattle. Along with Cattle, producers Tim Green and Michele Jones, also from Black and White, do all the advance work before handing the project over to the production teams that execute the operation. One of Cattle’s known mantras is that “90 percent of the work is done beforehand, 10 percent is on event days.” In others words, it’s all in the prep. This year, the Passion team hosted a pre-production meeting to go through the show from a purely functional standpoint; cue-to-cue. About 70 of the 440 crew members attended. All the technicians and engineers are told to go through the production run and try to find any weak links, gaps and glitches — and fix them. Toward that end, Hall created a 30-page briefing document to give to his eight LD’s. It had detailed and clear-cut directions regarding what to do at every point of the show, complete with solutions should problems arise. The core team at each venue was made up of four Black and White Live staff; a production manager, stage manager, production coordinator and a production assistant. “Overall, we wanted a cohesive, immersive visual experience for the attendees in each venue and the online viewers,” says Sheehan. “We want the people to feel like they are included in the show, not just watching it.” One of the goals for the simulcast was to provide the best quality visual experience possible. Black and White Live chose PRG Nocturne as their LED vendor. “The quality of screens, the latency on the images, even sightlines are factored into achieving this,” says Charboneau. During the three day conference, six sessions lasting just over two hours were comprised of multiple music acts and a 40-50 minute spoken word. The uniquely shaped stage was designed by Taylor to facilitate quick changeovers, to accommodate the festival like schedule of bands or speakers. “Once we sound-check bands, nothing got unplugged,” says Taylor. The rigs Bandit supplied to the arenas in Atlanta each had more than 250 fixtures. Hall spec’d large quantities of broadcast fixtures including Vari-Lite VL3500 Washes and Spots. “The VL is the classic workhorse in the industry, and Bandit prepped the somewhat older fixture immaculately,” says Hall. Martin MAC Viper Profiles filled in the rest of the system. For strobe/wash lights, TMB Solaris Flares and Philips Showline SL Nitro 510C were used. Besides the strobes, Hall was able to duplicate fixtures in all four rigs, which helped the looks stay cohesive across the conference locations. 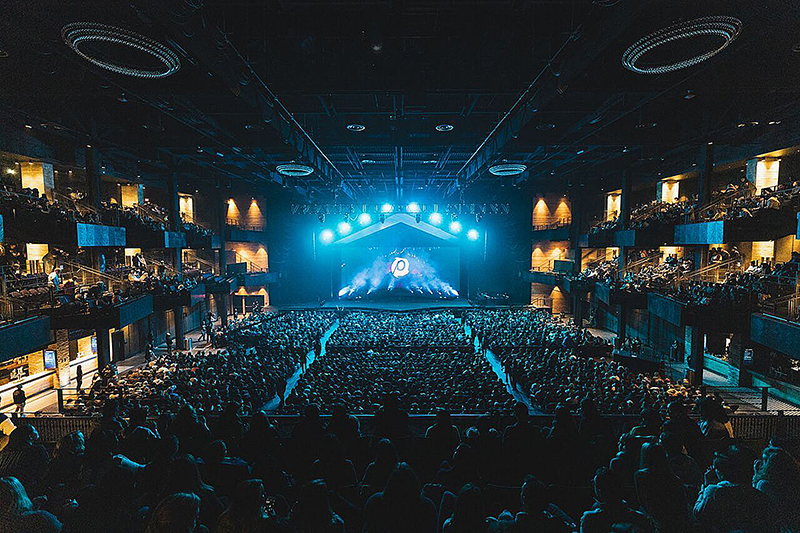 Robe BMFL FollowSpots were used in both Atlanta venues with their pan and tilt disabled. Tension and drag was achieved through the servo motor Robe developed. A dedicated grandMA is manned for these alone. One of the LDs at FOH controls intensity and color parameters while the operators provide pan and tilt. “Having consistency in Robe products was great for key light,” notes Hall. 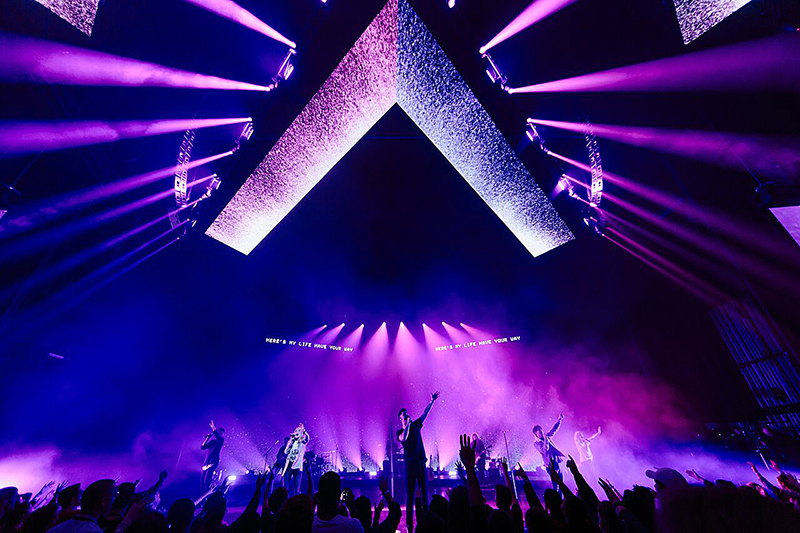 Bandit Lites has been working with the Passion Conference as a lighting vendor since 2009. Use of the link resolved latency problems across the four venues and played a huge part in the overall lighting; particularly key lighting. The opening night sequence provided quite a dynamic effect this year. SMPTE timecode was fired from the State Farm stage in Atlanta through the fiber trunk line via uncompressed video circuits to the three other venues. All the lighting programmed in previz for the opening look was synced to every board across all four venues. The local operators didn’t touch their consoles. It was all done by the musical director standing on the State Farm stage with a simple press of a button. The production used Riedel communications platform, which can trunk over IP. This enabled Hall to communicate directly with each LD in the separate venues just as if he were standing next to the person on headphones. Monitors for feeds from each venue were arrayed around Hall’s desk in Dallas. Through these, he could immediately access any adjustments necessary to the lighting. The setup is much like master control in a truck on-site. Throughout the conference, many moments occur where one band would stream over all four venues. With the Riedel communication system, Hall could have a mini conference minutes before the band hit the airwaves, all four LDs communicating to help make sure the looks, gobos, color, luminosity and color temp were all the same. Before each session, the Passion team repurposes the fiber line that links the four locations together. They have a room set up with a 60-foot screen and quad split and a camera to have a video conference. All the production and all the talent, including speakers and bands that are going to be in that session, go through for one last time what needs to happen during that upcoming session. Cattle started out in Atlanta, overseeing the two staggered arena load-ins, then hopped a plane for the Dallas load in. His colleague at Black and White Live, Tim Green, handled PM duties in DC. “My goal was to be available for team leaders to communicate with me easily,” says Cattle, noting how, by being in Atlanta at the center of communications, he was able to quickly respond to anything that needed to be done. And with Hartsfield Airport just up the road, he was able to quickly travel to Dallas once the Atlanta move-ins were underway. Streaming for the conference originates at the State Farm Arena in Atlanta. This is where three broadcast trucks are planted as well.